In this character-education school assembly program, James addresses the various types of bullying, why kids bully, and ways for students to deal with bullies. He stresses that “telling is not tattling.” Students need to recognize that informing the teacher or other adult about bullying behavior is not “tattling,” but a crucial intervention to help someone. This school assembly also addresses the role of character-education in bullying behaviors, since so often it is a group of kids abusing a single individual. James encourages students to be willing to stand up to the group, or at least walk away, and not be led into bullying behaviors by their friends. This is the question James asks throughout this challenging and powerful character-education school assembly program. James uses his magic to demonstrate the power of influence, and challenge students to hang with people who really care, and who are positive role models. I’ve been told numerous times that this was the best character-education assembly we’ve had, so that says a lot about your message and performance. I will gladly recommend you and look forward to working with you in the future. Students and staff are still talking about the show and using your message to spark discussions about character-education, and how we can become a society of up-standers. It really engaged the students, and we would love to have you back. Thank you for two terrific performances! The students were amazed with the magic, and your character-education message was on point for both age groups. Wonderful job using the magic to capture their attention, and getting your message across. Very impressive, and much needed at our school. I wasn’t sure how magic and the serious message of character-education becomes a successful assembly. I was blown away! If you decide upon a different profession, I suggest you become a teacher. You obviously know how to communicate to any age. Your energy was great, your message was great, and it was just what we wanted to tell the kids about character-education. Everyone loved the assembly! James Warren was the ideal school activity after a week of STAR testing! Kids and teachers alike were riveted by his magic: he had 350 students laughing hard. 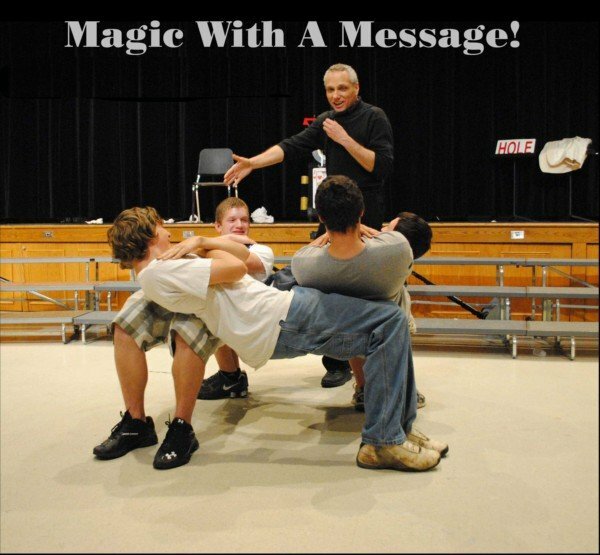 Additionally, Jim was able to weave in messages about the benefits of teamwork and not giving in to Anti Bullying as part of his magic act. I would definitely recommend him to other principals and schools. On behalf of Pacifica High School, I would like to thank you for your wonderful presentation on Anti Bullying. It is a challenge to explain the ramifications of Anti Bullying and you did just that in a way that captivated the students and brought forth their full attention. Your performance was the talk of the campus.